Here are some principles to help you set the selling pricing of your used coffee equipment. This is the amount that another party will actually pay for the item. The market value is subject to market forces such as supply and demand and susceptible to other factors such as advertising, trends and the seller’s reputation. To estimate the market price of your equipment, start by looking at the listing price of similar items on United Baristas. It is important to note that items available in the marketplace are not sold. Therefore they have either been listed too recently or are too expensive to have sold. 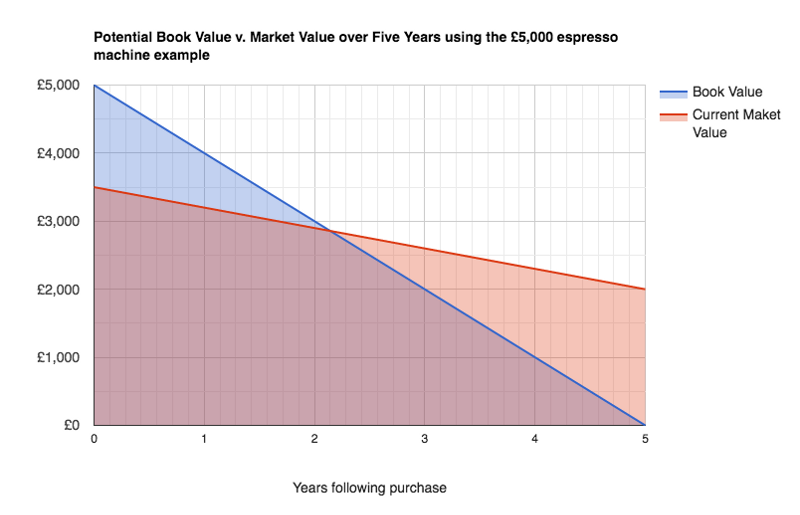 Representing these ideas in a graph clearly shows how sometimes book value is higher than market value — and visa versa. That’s actually a very low cost in comparison to all the daily costs of running a coffee business. However, if that machine was to sit around unused for five months before being sold, it’d have cost circa £415 of depreciation over that time. *** Most business owners would rather have had that money in the bank — and that’s also ignoring the cost of capital. United Baristas continues to receive requests to value used coffee equipment, especially espresso machines. Our position has been — and is still is — not to provide specific valuations*; however, we’re increasingly aware that some guidance would be useful for the coffee community. We are building up a picture of pricing on United Baristas Marketplace and will continue to share insights and trends to facilitate market pricing. Our observation is at present there is a mis-match between sellers and buyers expectations, so we’re working to close this gap through explaining these market principles. There is currently a community consultation open on how United Baristas can better communicate market valuations. For the sake of simplicity, these calculations exclude VAT. Read our Help Centre article on accurately communicating prices.